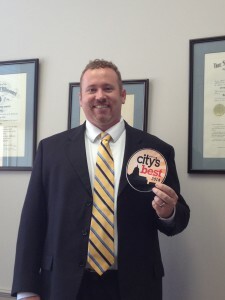 BSE Shareholder Scott Hamblin was recently named City’s Best Attorney by Jefferson City Magazine. For more than a decade, Scott Hamblin has litigated cases in Circuit Courts and United States District Courts throughout Missouri. Scott regularly practices in the areas of family law, divorce, child custody, paternity, child custody modifications, State and Federal Criminal defense including drug trafficking, drug possession, firearm offenses, sexual crimes, money laundering, driving while intoxicated (DWI/DUI), and manslaughter. As a former Assistant Prosecuting Attorney, Scott has gained substantial trial experience and insight which benefits his clients. As a result of his knowledge and experience, The Missouri Bar Association has invited Scott to lecture and speak to other lawyers at continuing legal education courses on the topics of criminal law and divorce. Scott also maintains a civil practice utilizing his courtroom skills to represent individuals, businesses and corporations involved in contract disputes, mechanic’s liens, real estate disputes, will contests, personal injury cases, worker’s compensation, probate proceedings, adoptions, guardianships, and conservatorships. Scott is involved in numerous professional organizations including the Missouri Association of Criminal Defense Lawyers, Family Law Section of the Missouri Bar, Missouri Association of Trial Attorneys, the Missouri Bar Association, the Cole County Bar Association and the American Bar Association. Scott is actively involved in the Jefferson City community. Scott currently serves as Legal Counsel for the Missouri Jaycees and the Central Missouri Foster Care Adoption Association. He serves as presiding Judge for the Elks Lodge #513. He serves on the Jefferson City Regional Board of UCP (United Cerebral Palsy) and is a member of the following community organizations: Jefferson City Chamber of Commerce, Jefferson City Chamber of Commerce Young Professionals, Jefferson City Jaycees, and St. Peter’s Parish.